The adventure continues! With the first element (earth) painfully collected within the Oracle, Ret Cooper and his friends return home to find that things are only heating up. Thanks to some mischief caused by the peculiar Benjamin Coy, Ret’s second scar makes its explosive debut. But what does it mean, and where will it take them? These questions gnaw at Ret as he begins his sophomore year at Tybee High. With challenging twists, inspired turns, and a few unexpected surprises, our hero once again confronts danger and disaster, while discovering newfound feelings for a certain female companion. Old friends and foes, along with a few new ones, follow Ret as more of our world’s mysteries lead him to Fire Island and the second element (fire). Ancient artifacts, a hot-air balloon, lines in the desert, a city in the mountains, tribal societies, and even the navel of the world all play their parts in Ret’s continued quest to fill the Oracle. This second installment in the Oracle series is a must read, full of fun, adventure, and wholesome purpose. Hang on tight as author C.W. Trisef takes you to places and predicaments you have never seen before or even imagined, and makes you feel like you are a part of Ret’s destiny, to cure the world. Oracle: Fire Island picks up where the first book left off. Ret, and his family/friends just got back from there journey to the Sunken Earth where they retrieved the first element; earth. The Oracle is still missing five remaining elements and must be completed to save the world. Ret and his gang must now set out once again to try to find which element is next and where it can be found. He is now having to rely on his friends for guidance but becomes overly worried about what is to come. Many new twists and turns will soon lead Ret on a course to find what he seeks but not without some trouble along the way. Author C.W. Trisef has done it again and wrote another thrilling adventure through a unique and face paced urban fantasy world. 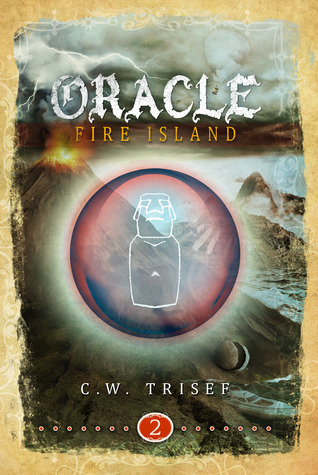 As the second in the series I found Oracle: Fire Island to be much more developed and enthralling. The story went much more into greater detail and understanding about the elements. The book held my attention all the way through unlike the first one. A very fun read, and with the mix of new characters added in made the book to be so much more exciting and evolved. I really do love that there is a hint of romance starting between Ret and Paige. I hope that in the next novel we will see more of this romance in bloom. All in all Oracle: Fire Island is a tremendous addition to the series and bring new life to this already magical world that the author has created. Very original and captivating, this book is one not to miss! Read my review of book one of the Oracle Series – Oracle: Sunken Earth.